Pardon us for a minute while we chat about, well…..showers. Many churches have a few spare rooms to house volunteers, plenty of toilets, and even a kitchen for meal preparation. But one hosting requirement remains elusive—a place for volunteers to bathe. One or two showers located near a gym/multi-purpose room just doesn’t meet the need for the number of volunteers required. We bridge that gap with portable shower trailers. Usually, a shower trailer starts out as a typical commercial pull-behind panel trailer; it’s then converted to its special purpose. The disaster response team from the California Pacific Conference in southern California recently built one. First UMC La Grange is also outfitting a trailer. “Members of the congregation will do the actual build out. We will use it for Harvey relief and any other disasters, plus other mission work and support of the MS150 cycling event,” said Bill Koenig, a church member. The Methodist Foundation provided funds for the purchase and out-fit of the trailer. 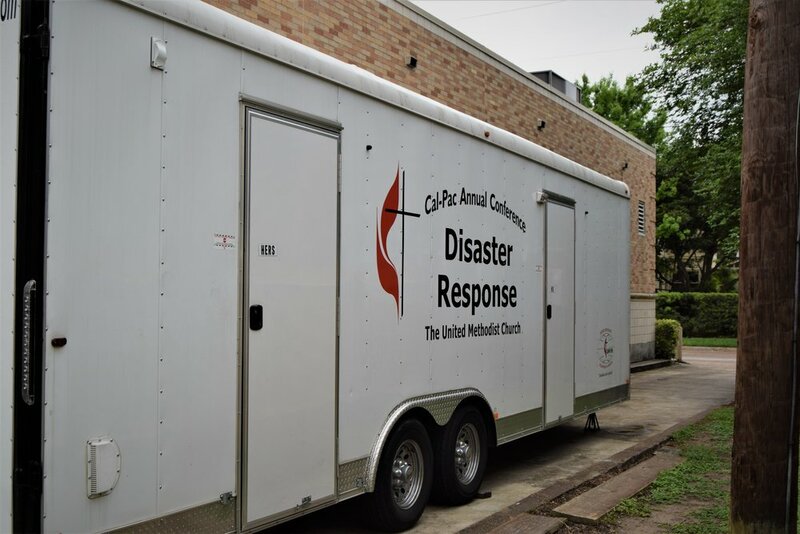 A Baptist and a Lutheran church are assisting in housing volunteer teams to La Grange; the Baptist church has loaned their shower/laundry trailer until First UMC finishes theirs. The trailer requires minimal set-up work once delivered to the site. Plumbing discharge is only “gray water” (i.e., no toilets). Local regulations vary but usually permit such drainage into an existing drain or into the ground via a perforated PVC pipe buried in a shallow trench. Heather Linville, business manager at First UMC Victoria, said, “We maintain the trailer by having it cleaned on a regular basis and refilling the propane tanks.” Power comes from extension cords run from inside the church building. Shower trailers usually include both heat and air conditioning, so they can function in a variety of climates. They’re built and designed to sit outside in the wind and the weather for an extended period of time.